What went wrong with Ski yoghurt? Earlier in the week a nostalgia themed Twitter feed, Golden Memories and Silver Tears, asked followers one of those deep and meaningful questions. What went wrong with Ski yoghurt? 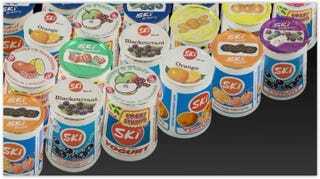 Chances are that Ski made the first yoghurt I ever ate. A little pot of joy to follow the main course at tea time. And wasn’t it great when you got a spoonful with a lump of strawberry or some other fruit? For many years, if I was going to eat yoghurt then it was going to be Ski. Except somewhere along the line I developed a taste for plain yoghurt. That might have opened the door on a shop’s own brand. I don’t really recall any other competitors back then. However, competitors did come. Ski reduced the amount of fruit in their pots and flavour seemed to go out the window. I liked an M&S custard yoghurt with a raspberry compote that sat at the bottom. Sainsbury’s had a honey and walnut yoghurt that caught my attention as well. Muller Corners seemed positively revolutionary at one point. Who needs Ski? The last time I had a Ski yoghurt it was a dreadful slop. This is ancient history because I have stayed clear of the stuff ever since. Am I being unfair? Should I try one again for old time’s sake?